Daniel W doesn't have a personal statement currently. While this is more "Hardware for the Gemini" rather than "Gemini Hardware", I felt it would be appropriate to mention it here. 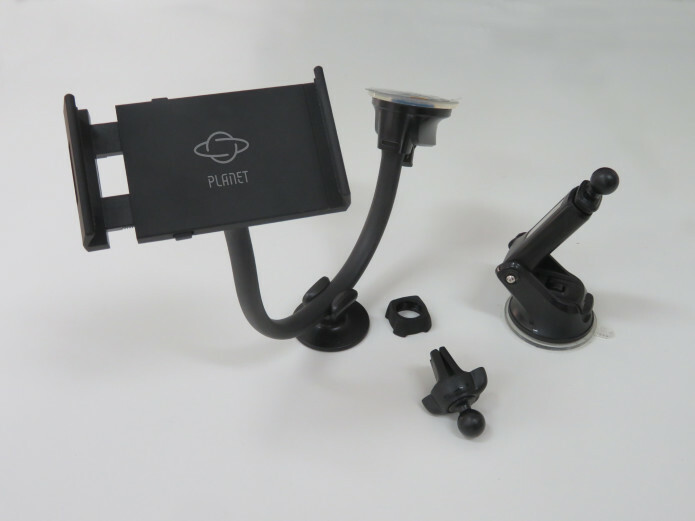 Over at the Gemini page on https://www.indiegogo.com/projects/gemini-p...bile-device--2/, a car mount kit for the Gemini (which will also fit the Cosmo as well) has been added. There are some details in Update#69 available on that page, for those who doesn't get the updates by e-mail. There are a few more pictures on the indiegogo page, but basically it seems to be a clamp wide enough to hold a Planet Computers device and a few mounting options intended for cars. I don't have a car, but I figured a clamp like this might be my next best option in lack of a proper tripod mount for my Gemini or Cosmo, so I've backed one, hoping that securing the clamp to a table with the suction cup will be sturdy enough, lest I find a way to put the clamp on a tripod. Other pictures over there shows that the clamp has an opening for a charger cable, which might be helpful for actual car use. Edit:Yes, it does fit the Cosmo too, text above updated. The rightmost key on the top row is, on its own, supposed to be backspace and, in combination with shift, to be delete. That works fine when I use the left shift key, but with the right shift, I get a somewhat strange behavior. When the cursor is at the very beginning (in the first position of the first row, if it's a multi-line edit) of somewhere I can type, right shift + backspace, as expected, works like delete, but whenever the cursor is somewhere inside a text, right shift + backspace doesn't become delete, but just backspace. The behavior seems consistent across the apps I've examined so far, such as AirMail, Agenda, Messaging, some notepad apps, and even in oddball locations, such as when editing a filename in the FM Radio app, so this seems to be a keyboard issue rather than a problem with any particular apps. The only exception I could find, was when I used the Microsoft Remote Desktop client to log on to a Windows computer. There, none of the shift keys made backspace work as delete, probably because Windows itself doesn't think shift + backspace equals delete. My Gemini has a Swedish keyboard and the "Integrated keyboard" is set to "Gemini Keyboard - Swedish", though I doubt the selected layout matters, as delete, presumably, is supposed to work the same across all locales. While waiting for the Cosmo, I'm trying to use my Gemini for most mobile-related things (except photos/video, actual phone calls and messaging) and thus I'm increasingly typing on it. I can press left shift + backspace even with one hand (say, when holding something edible in the other), though it's a bit awkward and sometimes a stray knuckle brushes against the screen, causing random results. Does anybody else experience this, and, if so, is there a fix for it? Early bird discount extended again... to 999 devices. Just noticed the $549 Early Bird Special is back again. As of now 831 of 999 are claimed. From what I understand, the three or so that backed the $595 perk, can just cancel and back the Early Bird again. I guess this extension is final, as they went with 999, rather than 1000. As I kept an eye on the campaign, I saw it reach 100% funding at 12:35 GMT (on nov. 5 2018), and I was really tempted, but I thought it would be irresponsible to replace a perfectly good Gemini after such a short time, especially since it's "just" my secondary/spare smartphone (as I'm a too much of an S-Pen addict to commit to just a Gemini). So I made a "devils pact" with myself, saying IF they extend the Early Bird campaign, then I'll bite. And they did. So I did. I guess we're going to need a new YouTube player in the living room some time next summer (as the current Windows 10 tablet struggles as soon as there's an update pending) . Oh, well. Enough ranting. Got get a Cosmo (reasonably cheap) while you can. I'll be here, contemplating what I just did, hoping there won't be any "first batch" issues this time. Other users have left no comments for Daniel W.